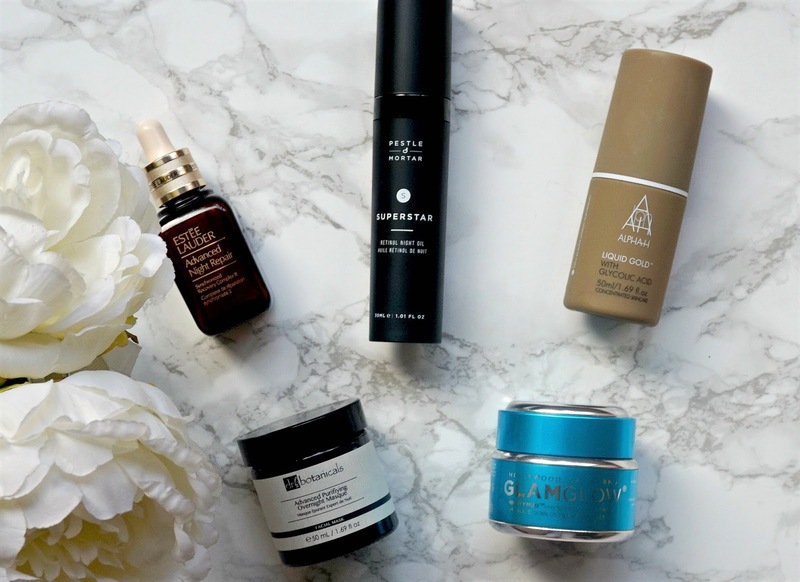 Five fab overnight skincare treatments you need in your life featuring Pestle & Mortar, Dr Botanicals & more! My night time skincare routine is one of my favourite parts of my day - sad as that may sound, it's true! I love the ritual of a double cleanse and then depending on what my skin needs on that particular day, I will follow up with a number of different products. Today I want to share some of my current favourite overnight skin treatments - I don't wear them all at the same time but sometimes do like to layer them to up the ante. Alpha H Liquid Gold: This product contains 5% glycolic acid, which is a chemical exfoliator that delivers brighter and smoother skin with refined pores. I apply this on a cotton pad and really concentrate on areas of congestion - for me, the chin and jaw line. It may tingle slightly when you begin using it but I don't feel any tingle now because I have been using it for around 4 years. Although this product is not recommended for sensitive skin, I don't have any issue when using it but if you have very reactive skin, it would be worth trying to get a sample first. This is one of those products that gives fast, visible results. The morning after using it, my skin looks clearer and feels soft. The directions say not to follow it with any other product, but sometimes I do - depending on how dry my skin is feeling. This is one of my essential skincare products that I have repurchased several times & will continue to do so. Recommended for all skin types. Pestle & Mortar Superstar Oil: Another hero product! This retinol night oil contains Vitamins A, C, E and B as well as Omegas 3 and 6 - all of these combine to improve the elasticity of the skin, repair scars, stimulate skin renewal and tighten pores. I apply this on clean, dry skin and because my skin is so dry, I need to follow with a moisturiser but for anybody who isn't cursed with extremely dry skin, this would work perfectly on its own. Although this is pricey, I can safely say that it is worth every penny. Anybody over 25 would benefit from this product. Dr Botanicals Advanced Purifying Overnight Masque: This is a recent addition to my skincare collection (thank you, Dr Botanicals for sending this to me), but it is a welcome addition! This product contains Papaya (high in Vitamin C for brightening the skin), Jojoba Oil (to improve skin elasticity) and Sweet Almond Oil (to soothe and soften the skin). The product itself is quite a runny-cream texture, rather than a thick cream, which means that it applies very easily. It can feel a little tacky on the skin initially but soon settles in so you don't need to worry about your face sticking to the pillow! The morning after I use this, the first thing I always notice is how clear and translucent my skin looks. I sometimes have areas of inflammation (due to the harsh medications I am on), but this product calms that redness. My husband has patches of eczema from time to time and he loves to use this during those flareups. I think that this product would be best suited to those with normal, dry, reactive or sensitive skin types. It is normally priced at £79 but for the month of March, you can buy it for only £19.99 by using the code BEAUTYLYBLOG at the checkout. Link here. Estée Lauder Advanced Night Repair: I've said it before and I'll say it again - if I could only use one luxury skincare product, this would be it! Regular readers are probably bored of me talking about this serum but I can't help it because it really is THAT good! This is not a product that gives instant, visible results but over time you will notice that it addresses all issues - it helps to repair old scars, renew the skin, firm the skin, hydrate and generally make your skin look stronger, healthier and more youthful. It is suitable for all skin types and although it is quite pricey, a little goes a long way. There is currently a 10% discount on this in Debenhams if you feel like treating yourself. GLAMGLOW ThirstyMud Treatment: Another long term love that regular readers will have heard me wax lyrical about many times before! This is the most hydrating mask that I have ever used - it really quenches my skin's thirst and I wake with bouncy, plump, hydrated glowing skin. I adore the caramel scent, the texture of the mask - basically everything about it! If you have thirsty skin, you need this mask in your life! Boots now sell mini pots of Glamglow masks so you can try them without spending too much. Have you tried any of these products? What are your favourite overnight skincare products? I'd love to hear in the comments below! All products are bought by me, unless otherwise stated. In this case, the Dr Botanicals product was sent to me. Opinion is always my own.